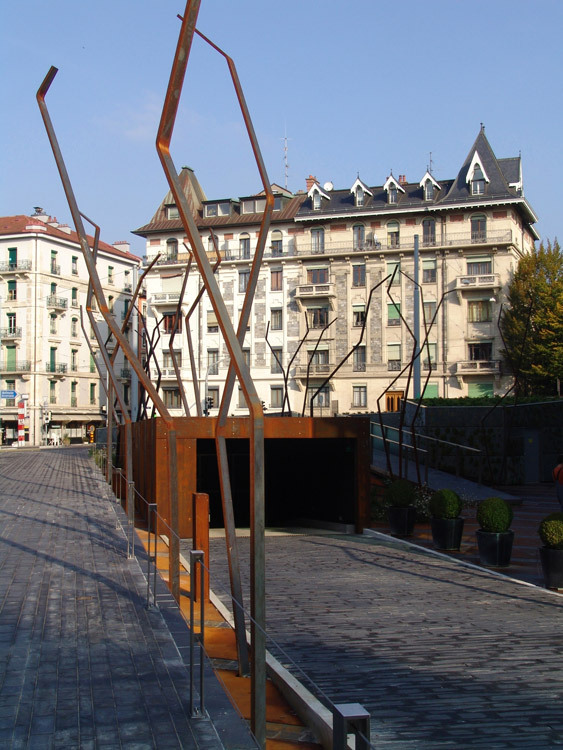 'Floor Works', a garden open to the public which surrounds a company headquarters in Geneva, is the exterior equivalent of the 'Wall Works', a collection of works by contemporary artists including James Turrell, Cindy Sherman and Sol LeWitt which adorn the building. Floor Works is what is produced by working the ground; that is to say by the manipulation – the gardening – of the available mineral or living materials. The project devises a unique means of support, which frees itself from the constraints linked to the many functional elements that emerge here and there, by covering them. Only one inert material, corten steel, has been chosen for manipulation. Laid out in successive strips, this red steel floor is folded or distorted according to the topography and the structures that need to be enclosed. It covers the entire garden. The edges of each panel are cut and folded, creating « shapes »; some of these provide support for climbing plants while others become seats that can be occupied by people. The layout is completed with some tall trees on the edges of the site, so as to consolidate the pre-existing verdant setting.